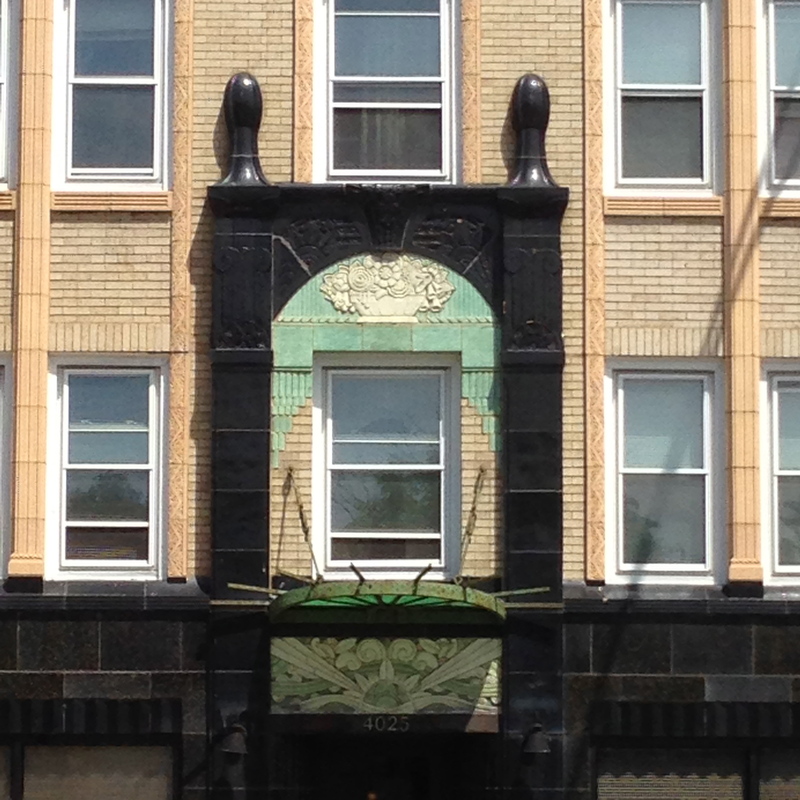 Examples of lovely light green terracotta and/or brick around the Mayfair, Jefferson Park, and Old Irving park neighborhoods. Click to expand. I’ll try to dig for more information. Cross-posted from my Gentleman Unafraid blog. 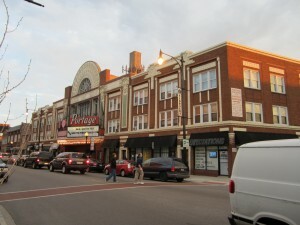 Note: I’m currently working on a Gapers Block piece about the Portage Theater (4050 N. Milwaukee) and efforts to prevent its purchase by the Chicago Tabernacle Church. Some passages and sentiments may carry over to that article, but the GB article will be more history-heavy. Just FYI. 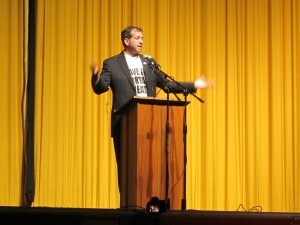 Monday night I attended the Save the Portage Theater rally. Appropriately, it was held at the theater itself. I’ve visited the Portage twice, first to take my son to a mini-comicon (where we took a picture with chubby, purplish Batman—a photo I hope he cherishes in his later years), and the second time to see Abbott and Costello Meet Frankenstein with my friend Pat. Both experiences were a tad cheesy, yes, but rare and sweetly enjoyable owing to their surroundings: a classic, old-school movie palace. 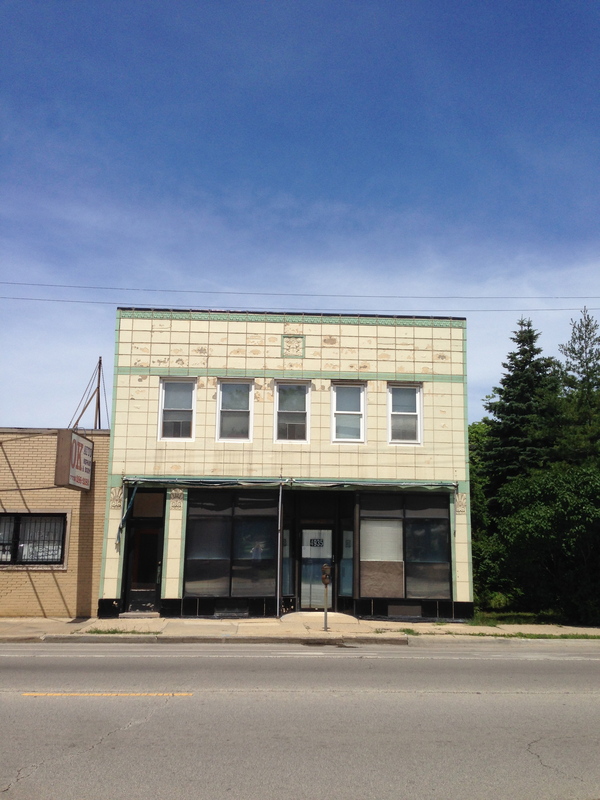 But experiences like will be harder to come by, if a certain church buys the place, modifies it, and declares an end to the variety of programming the Portage offers to the community. 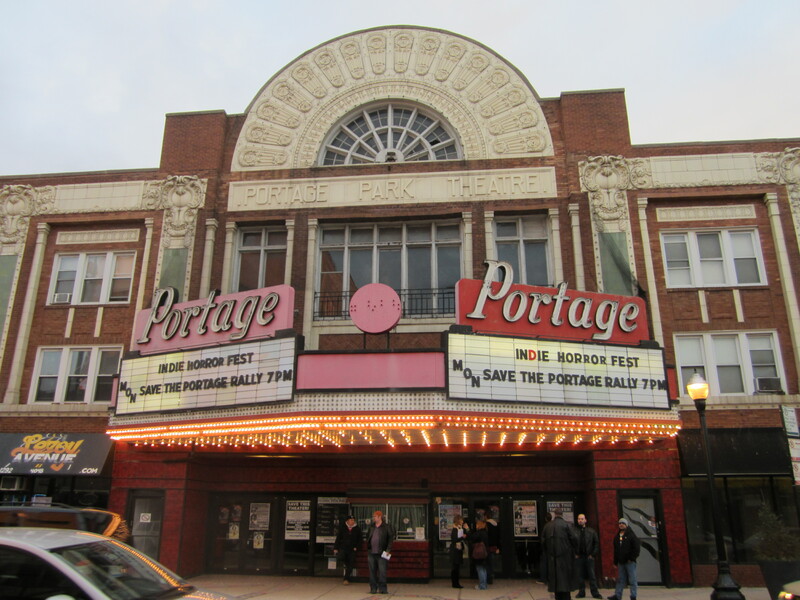 The Portage has been around in one form or another since 1920, starting out as a transitional theater (between the small vaudeville/silent film theaters and the later movie palaces) before being purchased and modified by the Balaban and Katz theater chain in the forties. Originally designed to reflect the poufy Beaux Arts/Neoclassical design favored at the time, Balaban and Katz brought a sleek, spare Art Moderne influence to the marquee and interior. Palatial doesn’t begin to describe it. Dream-like comes closer. I arrived early, signed in at the reception tables, and—after bumping into my father in law, a transplanted Irving Parker—walked into the auditorium. As before, and despite what the potential owners might think, the place is glorious. 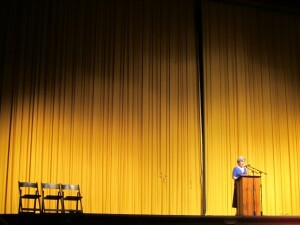 The auditorium is dark and cavernous, but also lush, golden, and warm. As with most buildings its age and older, you can practically touch the history and life of the place. I could easily imagine the audiences filling the seats for everything from early silent movies to 70s Kung-fu flicks to modern art-house fare. 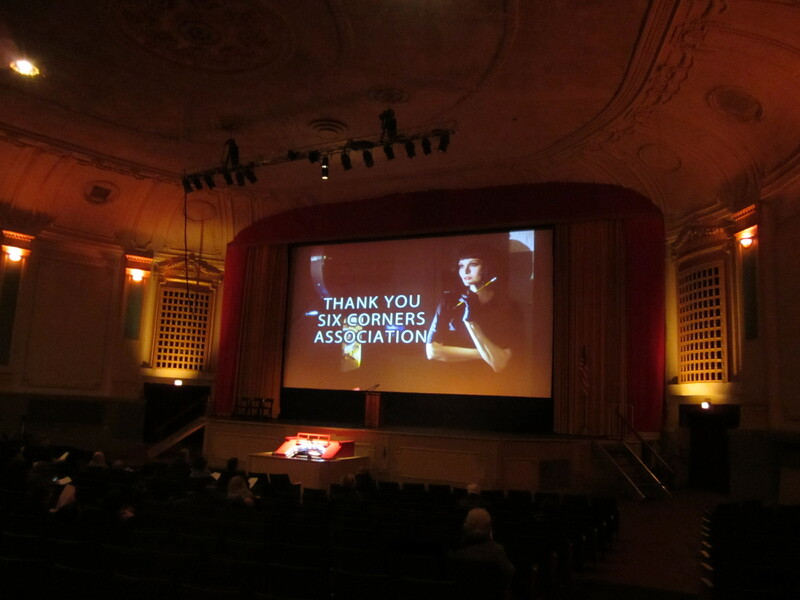 The evening was pleasant, informative, and ably led by Old Irving Park Association Vice President Anna Sobor. I believe I met Ms. Sobor a couple of years ago, when I conducted tours of my church during the annual Old Irving Park House Walk. 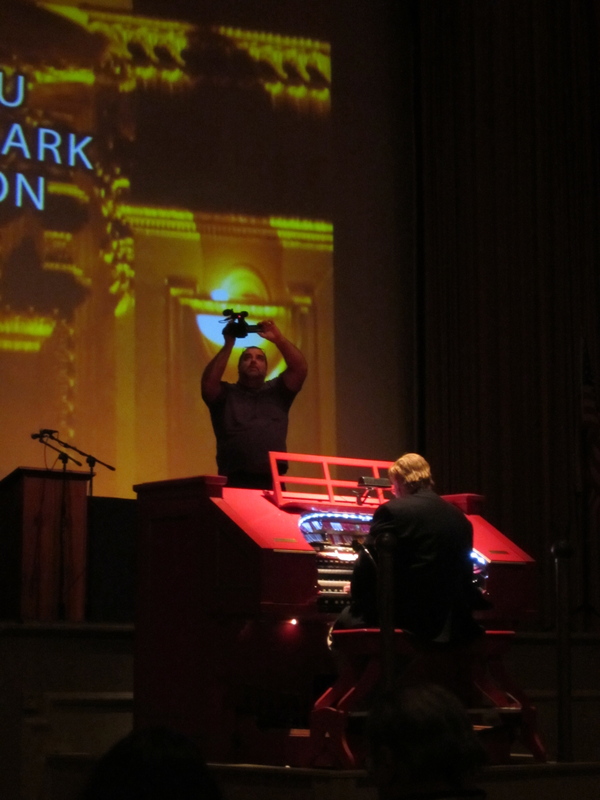 But before she walked onstage and got things rolling, we enjoyed the organ-playing of Mr. Dennis Wolkowicz, motivating force behind the theater’s restoration. 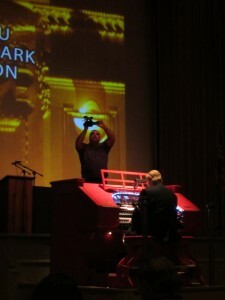 As he ran through a familiar (and not so familiar) back catalog of songs on the theater’s original Kimball organ—placed on mechanical riser to awesomely cool effect—the place filled up with hipsters, senior citizens, Chicago neighborhood types, and members of the local cultural aristocracy. A lot of bearded guys with big guts were present too. I think I recognized them from the comic show and horror fests. In the dimness and darkness I could see a hundred blogs, tweets, and updates being typed out as one. Not every seat was filled, but at least half were. For a 1,300-seat theater that’s not bad. Illuminated thank-yous were projected on the screen, especially to preservationist ringleaders like alderman John Arena, the Portage Park Neighborhood Association, the Six Corners Association, and others. Digital cameras flashed every which way, and, appropriately, amateur and professional cinematographers shot electronic footage of the proceedings with their cameras and iPhones. 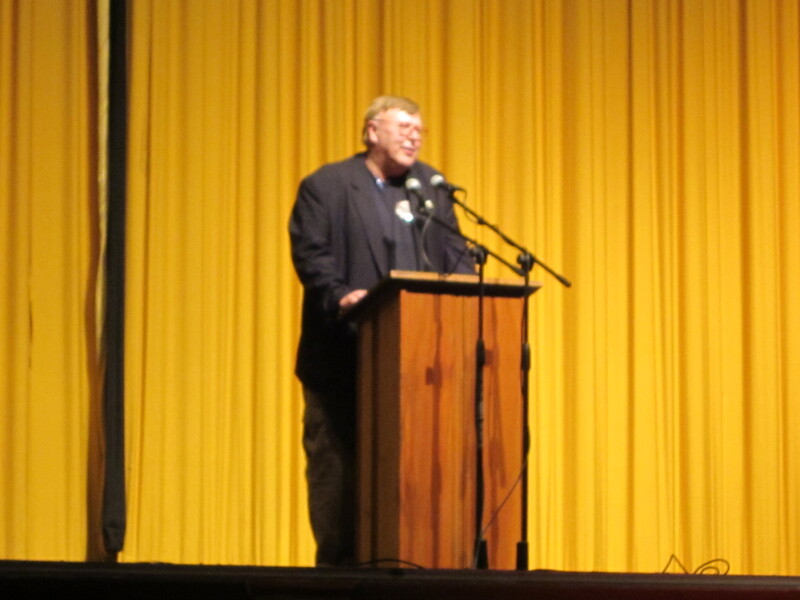 In closing, Mr. Wolkowicz led the audience in a muted version of “The Star Spangled Banner.” I got the feeling not everyone learned the lyrics in Boy Scouts, like I did. Still, all respectfully rose up, and made a game effort to be melodically patriotic. After all, that was the reason why we were there. We’re Americans, dammit, and we’re mad as hell someone’s trying to take our stuff. Rise up, my darlings, rise up. You have nothing to lose but your theater chains. 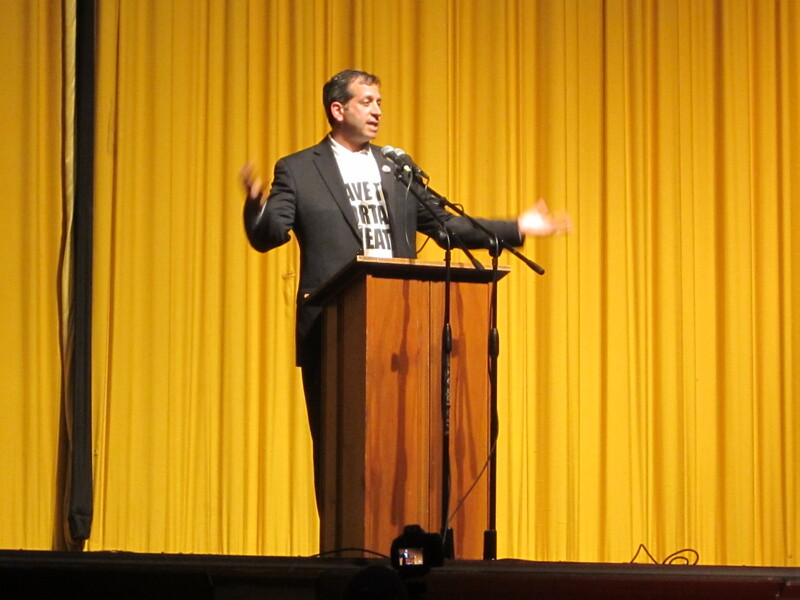 Mr. Wolkowicz concluded his set, but was informed that folks were still signing up outside. So, he returned to the keys, and vamped out a little “Take Me Out to the Ballgame.” On the northwest side, the audience clearly root-root-roots for the Cubs. A little perspective on the size of the stage and screen. 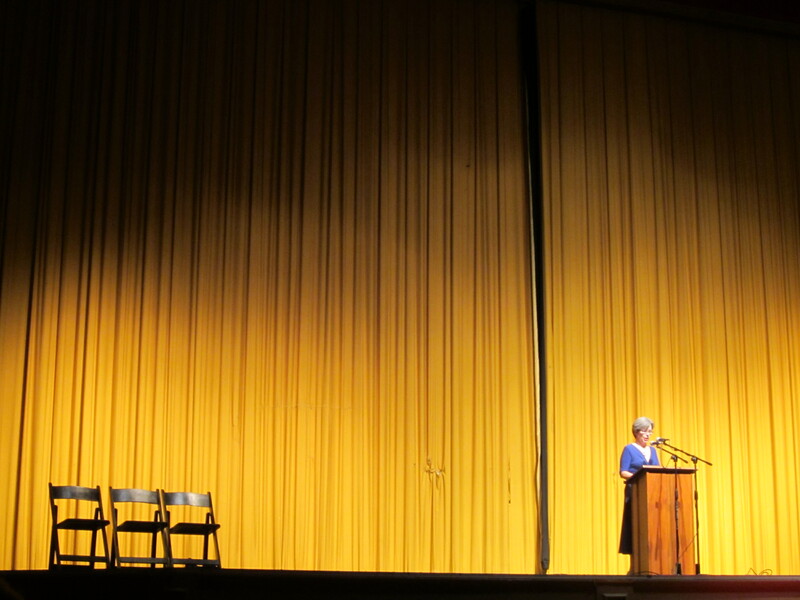 At last, Ms. Sobor took the stage, and thanked Mr. Wolkowicz and all dignitaries present. Alderman John Arena—prime instigator of the Portage campaign—was present, looking casually fashionable in a windbreaker and “SAVE THE PORTAGE” t-shirt. His colleague Alderman Tim Cullerton of the 38th ward sat nearby, appearing firmly entrenched in his suit and tie. Ms. Sobor wasted no time, asking the audience to keep a civil tongue, and stressing that the biggest goal of the campaign was to support local businesses and let them know they’re being “patronized” by Portage supporters. As I later learned, the Chicago Tabernacle folks have given similar instructions to their throng—as a tax-free group I assume they’re attempting to sound financially lucrative. 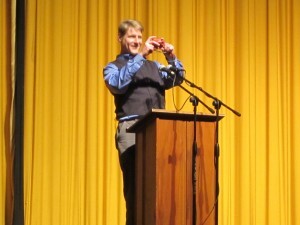 Sobor then introduced Arena, who, if the applause was any indication, needn’t worry about several hundred votes in 2016. The man is a decent speaker, and he reminded me that one of the reasons I voted for him is his approach to pragmatic preservation. 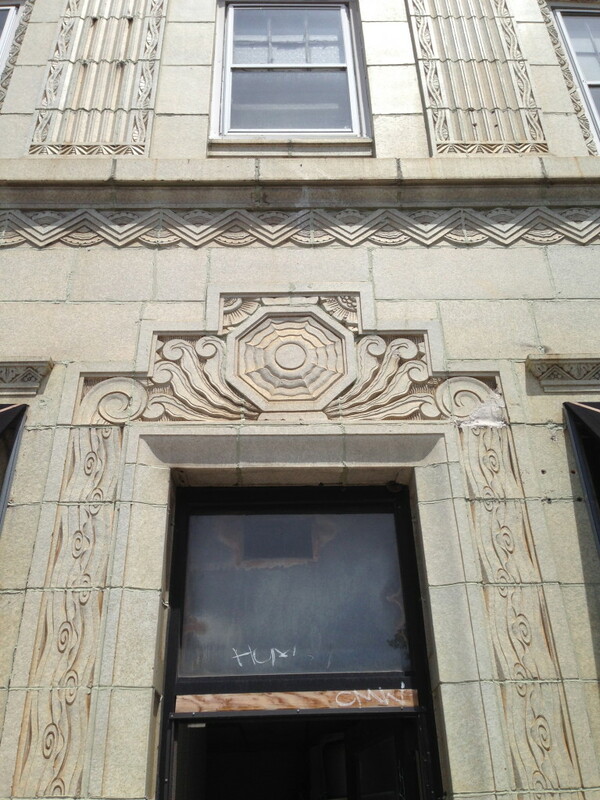 Protecting pretty buildings is fine, but they need a reason to exist and a healthy local economy to persist. 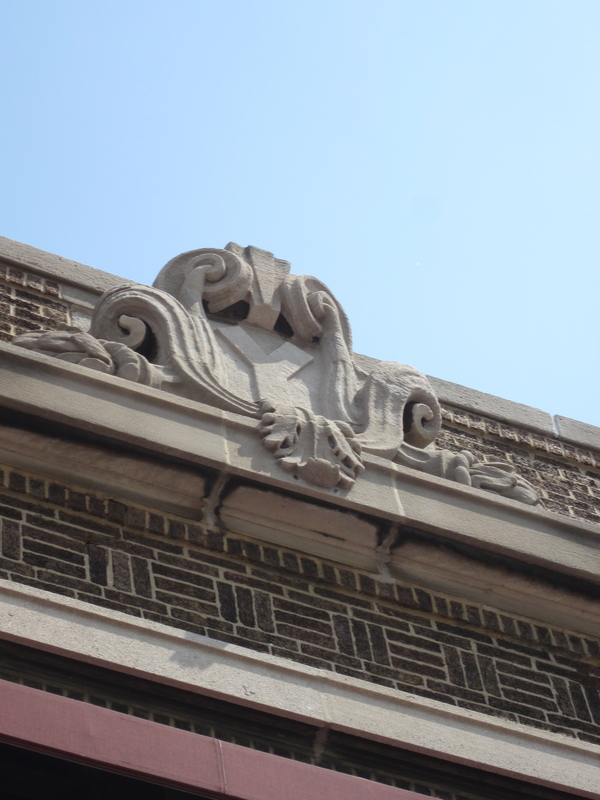 The folks behind the Portage’s restoration have done as much, and the theater is viewed as an anchor for the Six Corners shopping district. 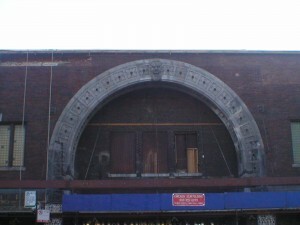 Once upon a time, this was the greatest and busiest place to shop, eat, drink, and see a flick outside the Loop. For the past several years, before he was even an alderman, Arena and others have tried to give the slightly shabby Six Corners a economic shot in the arm. Thus far things have been looking up. 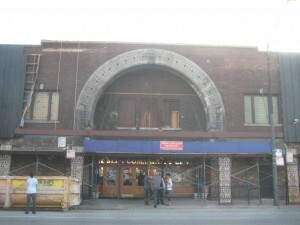 Then the Chicago Tabernacle Church approached him last September, asking for his support as they sought to buy the theater and convert it into a church. Arena asked for a write-up of their intentions for the property, and what they presented to the zoning board was (in my words) horrifying. CTC’s plans included removing the snazzy marquee outside (not sure if this includes the original terra cotta PORTAGE PARK THEATER marquee out front as well as the flashy electric one; I hope not), get rid of the businesses currently occupying the storefronts, and convert the auditorium and apartments inside into classrooms. Arena said um, no thank you, but welcomed them to the area and suggested several local properties that would better suit their and the community’s purposes. The church’s subsequent lack of response showed they weren’t interested, and have proceeded to push for ownership of the building and their proposed changes. Minimized? Not really. More like irrelevant. Chicago is surfeit with churches, religious choirs, and Easter presentations, but lacking in classic movie palaces and independent film venues. Eleven churches of varying sizes are within walking distance of the Six Corners district; but only two movie theaters (including the newly restored Patio Theater, which continues to exist by the skin of its teeth) currently operate thereabouts. Whether the 11 churches (not to mention the nearby Islamic center and Buddhist temple) are the right kind of churches according to Mr. Toledo… Well, let’s not touch that point just yet. Fans of the theater have been called on to grit their teeth and echo alderman Arena’s point that the church is welcome to the community (because, sure, we could always use more tax-free soul-winners who believe the Four Horsemen of the Apocalypse could come galloping down Milwaukee Ave. at any moment), and thus far everyone’s played nice. Thus far. 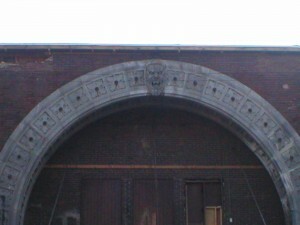 The Save the Portage Theater site. 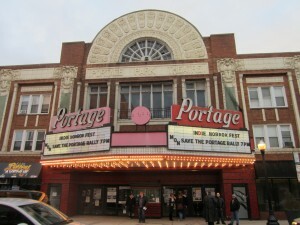 Save the Portage Theater Facebook page. Alderman Arena’ post on Everyblock. 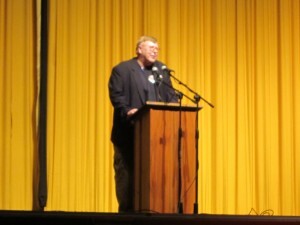 Dennis Wolkowicz, the organist and one of the prime movers on the restoration of the theater several years ago, closed the meeting, dubbing it a “community explosion.” He shared a bit of Portage trivia, explaining that back in the 80s the theater was sliced down the middle by a wallthat’s since been removed. The seats reflected a curious and unwitting division of political proportions by having red seats on one side and blue ones on the other. This was rectified when director Michael Mann shot Public Enemies with Johnny Depp there in 2008, using the theater as a stand-in for the Biograph Theater on Lincoln Ave. Red and blue seats wouldn’t do, so the film company sprang for blue cushions across the board. No comment. The meeting closed with reminders that letters to the ZBA could be returned in the lobby, and that various spokespersons would be available for interviews. I needed to get home, and after running into a workmate and my church’s pastor, I headed out to spread the word. I hope you do likewise, dear reader. Check out the above links and take action. Come on. I’ve got kids who need to see Frankenstein on the big screen! Look Upon My Facade, Ye Mighty, and Despair! But who were Tryon and Davis? I wish I could say. Beyond discovering that Tryon is a British name and Davis a Welsh one, information is spotty about the two (assumed) men. 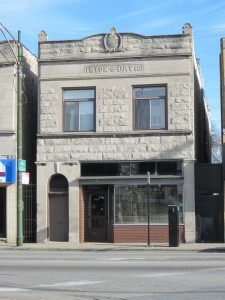 A review of historical newspapers and Google Books suggests that T&D was a real estate agency, and probably a developer as well, owing to occasional references on real estate sites to a “Tryon & Davis subdivision” located near Lawrence and Pulaski. Obviously, T&D were successful enough to construct their own office building, but otherwise they made little impact on Chicago history. All I’ve turned up are two meager references to plumbing work being done for several single-story dwellings near 2345 W. Roosevelt Road (apparently demolished) in 1921, and the management of a property at 118 N. LaSalle St. (also gone, but now occupied by Murphy/Jahn’s 120 N. LaSalle building—the one with the whacky Daedalus and Icarus mosaic). 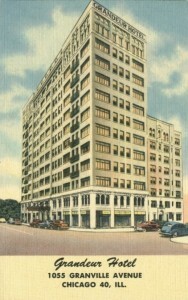 The firm later listed an address in the 1915 edition of Polk’s Real Estate Register and Directory of the United States and Canada at 4601 N. Crawford (now Pulaski Rd. ), which is currently occupied by a Citgo gas station. 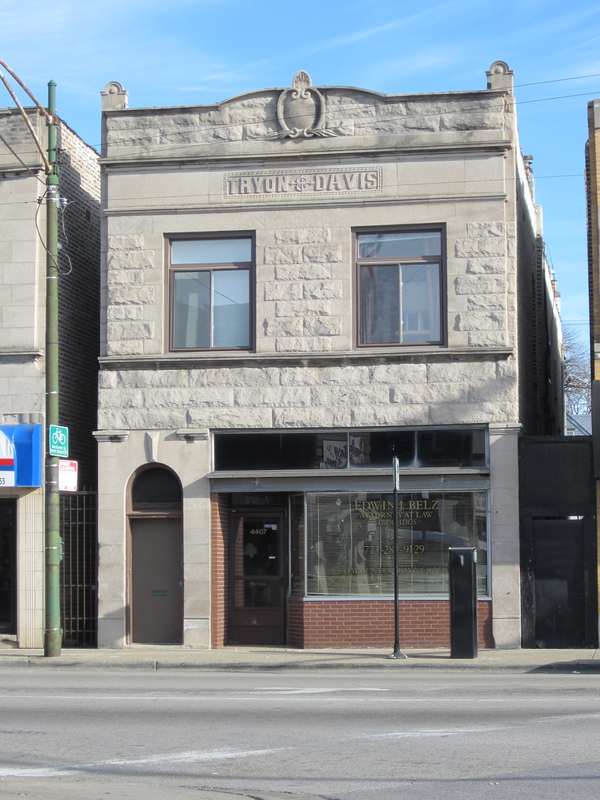 Did T&D move there from their Elston digs? Did they expand? Without a day’s visit to the history museum or library, I can’t say. I’ve sent an inquiry letter to the building’s current resident, a lawyer, and I’ll provide an update if I find out anything else. The former Rivoli Theater, now the Muslim Community Center, at 4380 N. Elston Avenue, showed a little bit more of its original facade recently. Check out the roaring beast-man(?) on top! 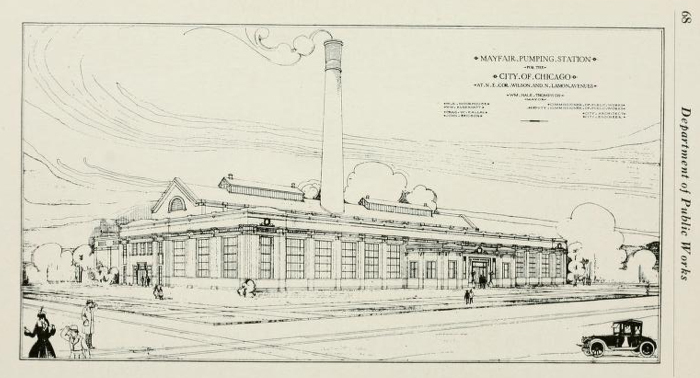 Presumably, the original conception drawing of the Mayfair Water Pumping Station. Every raindrop promises life or death. Somewhere in-between rests inconvenience. Here, lately, water is a petulant creature, severely perturbed by years of abuse. When it snows, it smothers us, and when it rains, it pelts, torrents, and creeps in, destroying basement furniture and carpeting like a bad houseguest. In the blasting heat of summer, our beaches threaten to become festering petri dishes of bowel-blasting bacteria. A city built on a swamp, despite Ellis S. Chesbrough’s best efforts to raise us from the muck, it feels like the water won’t leave Chicago alone. Constantly seeking its own level, it sometimes chooses to drag us down with it. If things run smoothly, you won’t hear about it in the news. The bleeding leads, and the few times the Mayfair Pumping Station pops up in the Trib for the next seven decades usually involves violence, semi-biblical snafus, and moments where blood flowed like water and vice versa. Jumping ahead to the 1960s, on January 5, the fire department arrived to douse a fire at the station. Ignited by welding equipment, a shower of sparks set ablaze a inconvenient pile of paper. While the station and its equipment weren’t damaged too badly, four firefighters were transported to Northwest and Swedish Covenant hospitals and treated for smoke inhalation. Two years later, in an exceedingly brief article, we learn that city worker William Dugan, 57, fell off a ladder July 10, while fixing the station’s roof. His fellow workers, reportedly, “were unable to explain the accident.” Mr. Dugan doesn’t turn up in the obituaries later on that week, so perhaps we can assume the best. Then we have James and Nina Gardiner. James, age 28, had, in a matter of speaking, been unfaithful. Not necessarily to his wife, Nina (23), but to water. If that sounds daft, that’s because it is, but allow me a momentary Fortean flight of fancy. 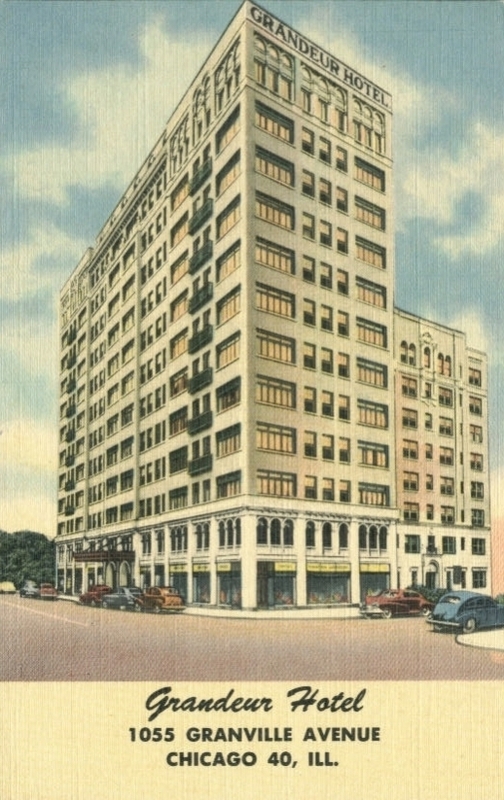 It was January 17, 1930, and Nina and James (two years married), were fighting—presumably again—in their rooms at the Grandeur Apartment Hotel (now Grandeur Apartments at 1055 E. Granville). James worked as an sanitary district engineer at the Mayfair Pumping Station; while Nina, to her great shame, was a secretary to Criminal Court Clerk John H. Passmore (seen here standing beside legendary conman Yellow Kid Weil). “To her shame,” because Nina was forced to take a job rather than keep a house, James having failed to bring home the bacon. James showed his, let’s call it “hydro-infidelity” by both avoiding work at the pumping station and running into the arms of the local saloons. According to the two available photos of her, Nina was a pretty young thing with devil-may-care eyes and a winning smile. 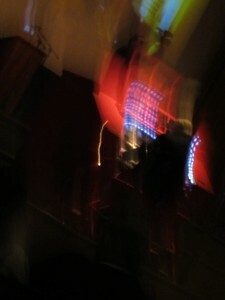 James, perhaps unpossessed of a flapper’s allure, remains faceless to us. Returning the the apartment—oh, let’s imagine it with a rusty sink, Murphy bed, and grim breakfast nook equipped with a hot plate and dingy side toaster—James had been absent for two days, returning without explanation and with hootch on his breath. Nina asked where the hell he’d been. James replied with his fists before turning in to bed. Nina wasn’t having it. She opened a drawer, grabbed a revolver, carried it to where James lay, and began pistol-whipping the engineer. Unappreciative of her failure to ventilate his head, James slapped Nina around a little more then entered the bathroom—let’s picture it with a rustier sink and a single bulb dangling from the ceiling—to clean his wound. Washing the gore from his hair and face, dripping a far-too-late blood sacrifice into the sink, he told her more beatings were in the offing. The Gardiners were absent from the papers for a few months. Until March 5, when the couple traveled down the Memphis-Bristol Highway on a reconciliation vacation. The facts are hazy about why the two kissed and made up, or even how far the case got in the courts. Maybe it was a different time, when a little light attempted homicide could be waved off by a romantic old fool of a judge. The couple barreled down Tennessee State Route 1 on a dark Wednesday night—then the rest of the tale played out like a Tom Waits song. The steering wheel broke, sending the car soaring over the embankment before planting it grill-first in a ditch. Buried deep in the mud, the water seeped in and reclaimed James and Nina. Shortly after, Mr. William A. Williamson of Mason, TN, saw the car’s taillights gleaming in the night and reported the accident. Nina and James were draped over the car doors, more than likely having tried to escape the car before the crash. And just like that, the engineer and stenographer were gone. Bonus: Photos from the groundbreaking and opening of the Mayfair Water Pumping Station from the Chicago Daily news photographic archives. Alderman Ellis Geiger digging at Mayfair Pumping Station while other officials watch. 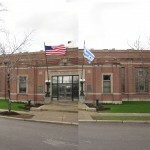 During his stint as Chicago’s city architect, Charles W. Kallal designed, or at least oversaw the construction of multiple municipal buildings across town. 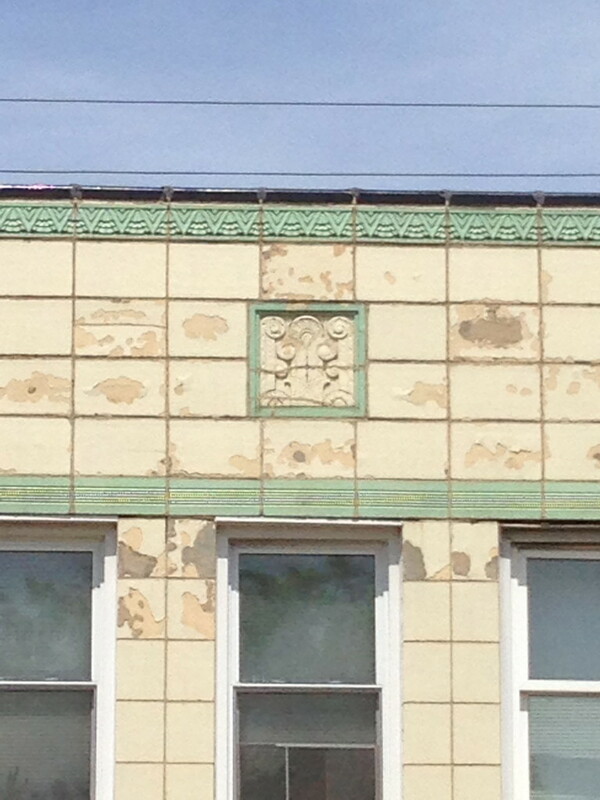 Mr. Kallal—identified as “City Architect” on a plaque near the pumping station’s front door—is a bit of a cipher. Finding his grave was easy; locating a photo of the man was near-impossible (Dominican University has one in their files; I’ll soon stop by to pick up a scan, so stay tuned). Born of Bohemian-American stock on July 8, 1873, Charles William was originally baptized Karel Vilem (at least per one genealogy site). I suspect he Americanized his name to ease assimilation. Little turns up about the man’s life until 1897 when he collaborated with architect Joseph Molitor on the former St. Vitus Church (1814 S. Paulina) in Pilsen. We know he married Miss Barbara Birnbaum at some point, and the two raised a flock of kids—five daughters and a son (the latter of whom went MIA in 1945 while serving in the southwest Pacific before being declared dead a year later). What remains unclear is how much Kallal actually designed himself versus contracting outside architects. Were there enough hours in the day for one man to create a city? 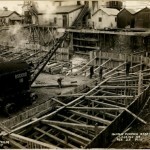 Whether bureaucrat or Herculean city-builder, Kallal’s name frequently pops up in trade rags of the day—mostly periodicals with stultifying names like Electrical World, The Heating and Ventilating Magazine, The Metal Worker, and Water and Sewage Works—connecting his name with several existing, demolished, and perhaps never-erected buildings. 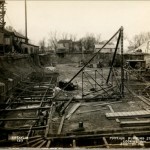 Obviously, he kept busy, either drawing up and/or submitting plans for numerous Chicago police, fire, pumping, and power stations, bath houses, building additions, and, by one account, the city’s first outdoor natatorium (oddly referred to as an “artificial swimming hole,” what we would call a pool). While neither particularly ingenious or innovative, Kallal’s buildings have a wonderfully nostalgic air, recollecting the age of sleeve garters and handlebar mustaches. They are old-fashioned and unpretentious, possessing an amiable civility and admirable lack of cynicism. While he didn’t build it, Kallal served as custodian of Chicago’s City Hall, a Classic Revival Structure designed by Holabird and Roche in 1911. Kallal kept things tidy, overseeing the chief janitor, the building’s chief operating engineer, and the entire maintenance staff, including, interestingly, all of City Hall’s carpenters and cabinet-makers. 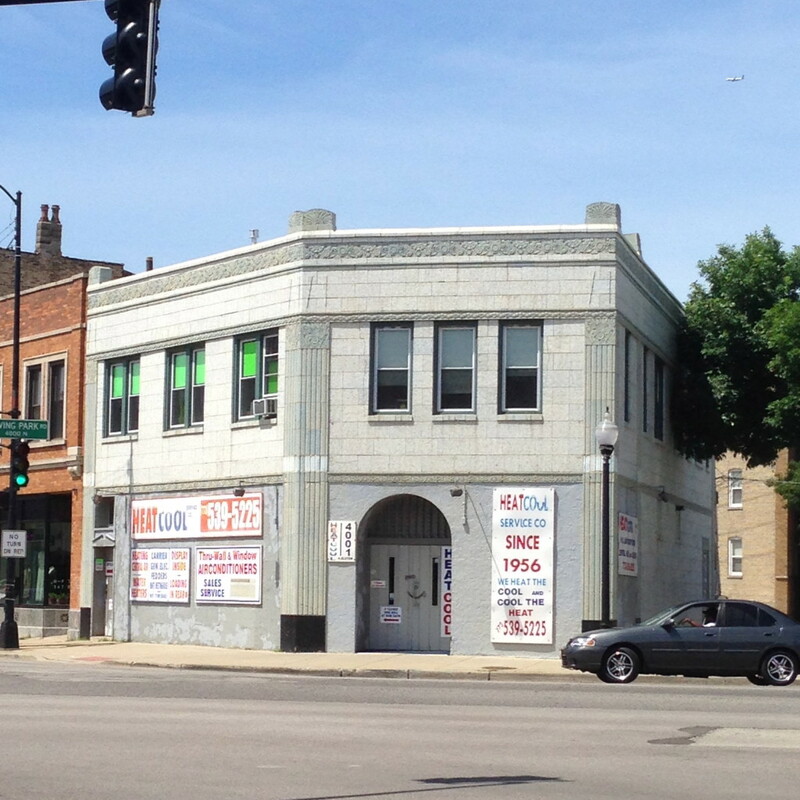 Non-Chicagoans may recognize it as the building where the Bluesmobile finally broke down. This was no doubt the same “hospital with glass rooms” promised in an article in the 1913 issue of Heating and Ventilating Magazine. Kallal’s plans for the new $300,000 “isolation hospital” promised creepy “…glass hospital rooms, equipped with telephones, permitting persons recovering from contagious diseases [Writer’s note: mostly tuberculosis] to be visited by relatives and friends.” The hospital would be located at 31st Street and Marshall Boulevard—land currently occupied by Cook County Jail–but ended up instead at 3026 S. California Blvd as the Municipal Contagious Diseases Hospital. As of April 25, 1915, Kallal’s office was at work on the plans, but Young raised Cain about the location. 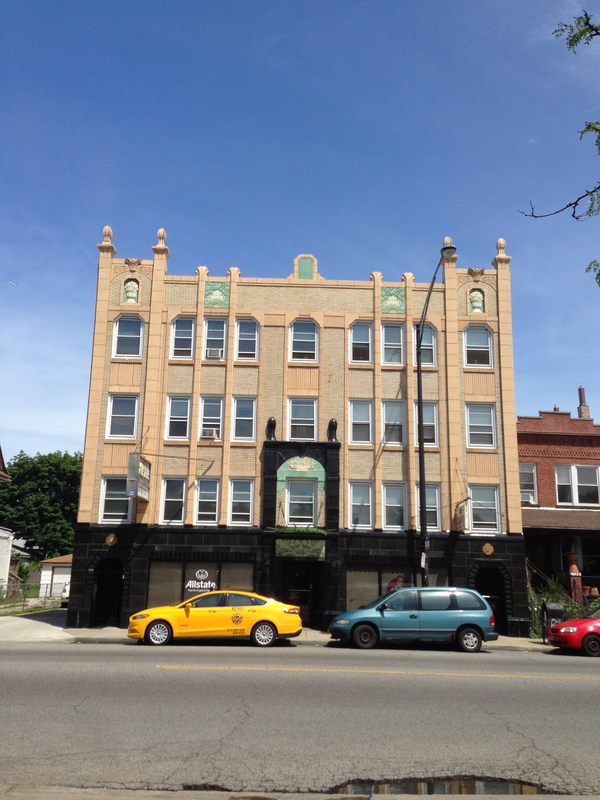 The City Council Committee wanted it built near the old hospital in Lawndale. Young nixed that, saying it was a waste of money and good buildings. 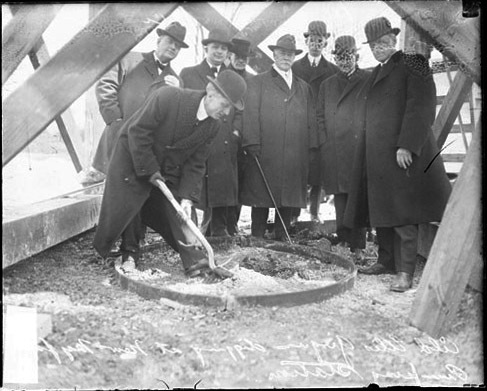 On January 4, 1914, Kallal got a raise, along with Health Commissioner Young and Deputy Building Commissioner Robert Knight. Building Commissioner Henry Ericsson (who shares several commemorative plaques with Kallal) did not. Not to worry—Ericsson felt little pain, already making $6,000 and requesting $10,000. Kallal, however, got a $1,000 bump to $5,500, while Knight went from $4,000 to $5,000. All this took place during Mayor Carter Harrison, Jr.’s stint as mayor from 1911 to 1915. Costs to fix the problem were calculated at $37,000, and rumors flew that Kallal might get the pink slip. It appears he didn’t, however—or at least there was no follow-up story. Kallal’s obituary shows he was affiliated in some way with the firm of Cram and Ferguson, historically, builders of college and religious buildings. The very nice folks at Cram and Ferguson told me they have no records of Kallal’s years with the firm, but I’d hazard to guess that he worked for them in the 1890s (as suggested by his work with Joseph Molitor) rather than moving on to them after his stint as city architect. 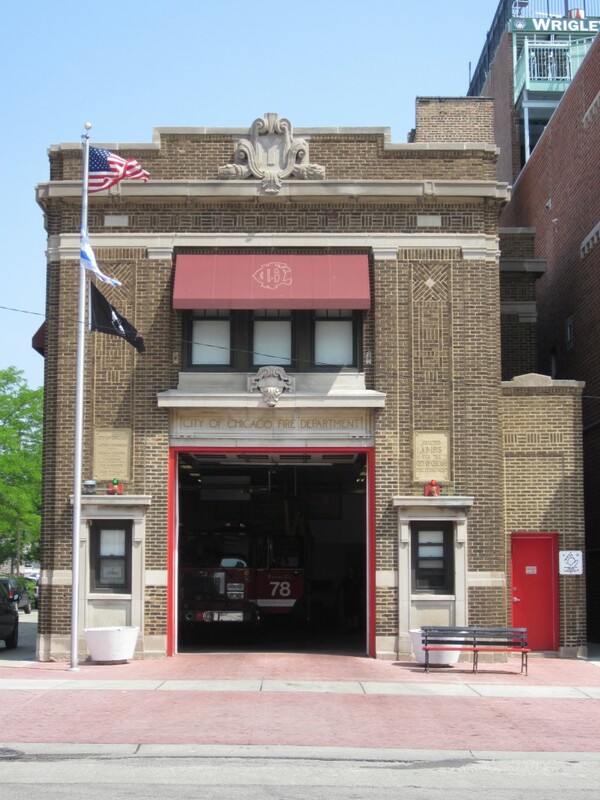 Besides the Mayfair Pumping Station, Kallal’s most readily recognized structure is likely Chicago Firehouse #78 (1052 West Waveland). Standing in the shadow of Wrigley Field, it was built in 1915. 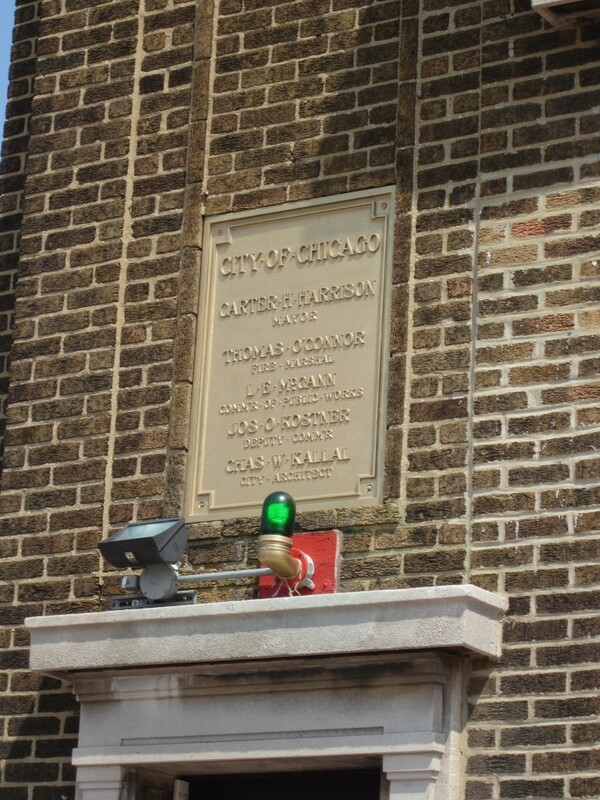 The book A Chicago Firehouse states that even though Kallal’s name appears on the plaque out front, he probably didn’t draw up the plans for the fire station himself. 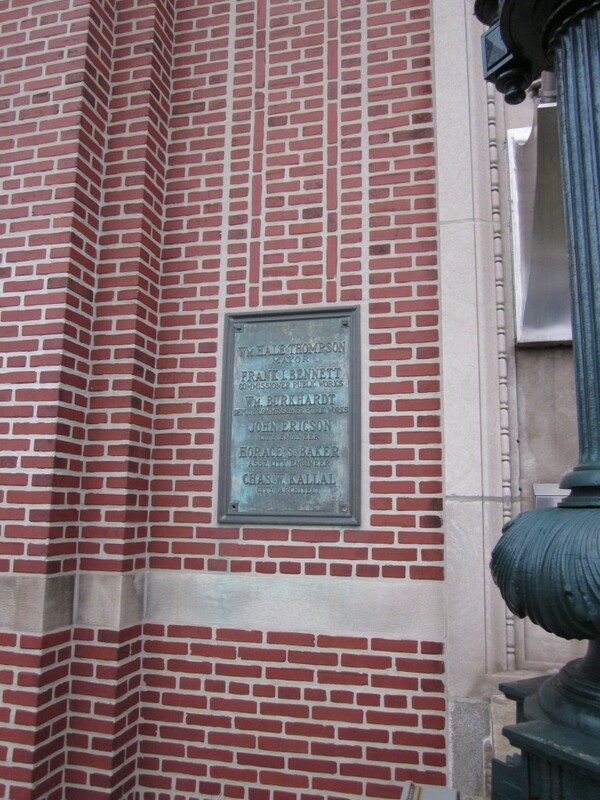 Regardless, Mayfair Pumping Station, the firehouse, and the Department of Gas & Electricity Southwest Substation (mentioned below) reveal elements suggesting a shared hand. 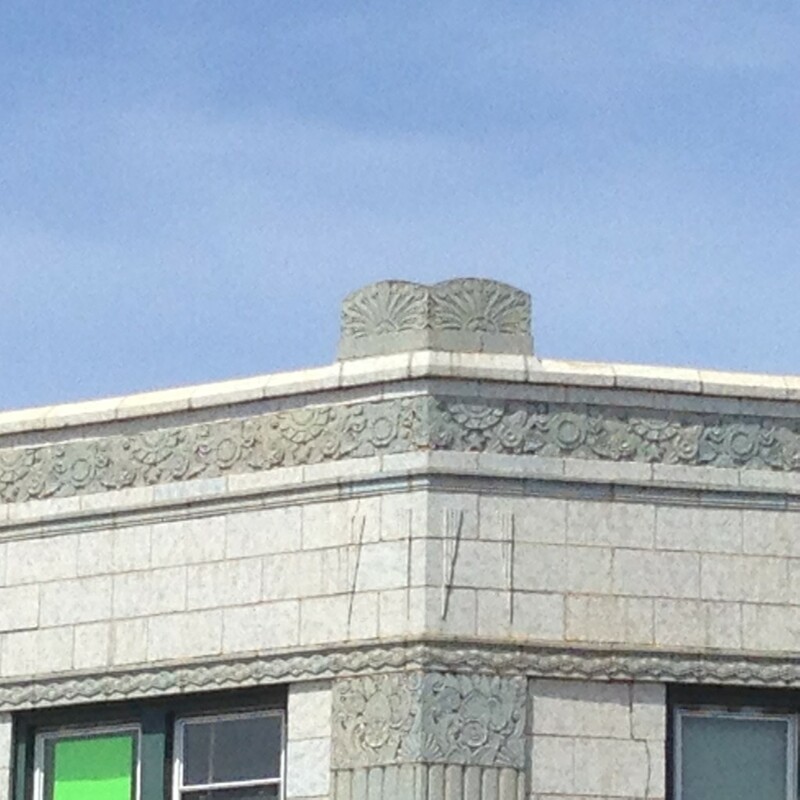 The brickwork is set to form alternating patterns, culminating in checks, pinwheels, and other shapes. 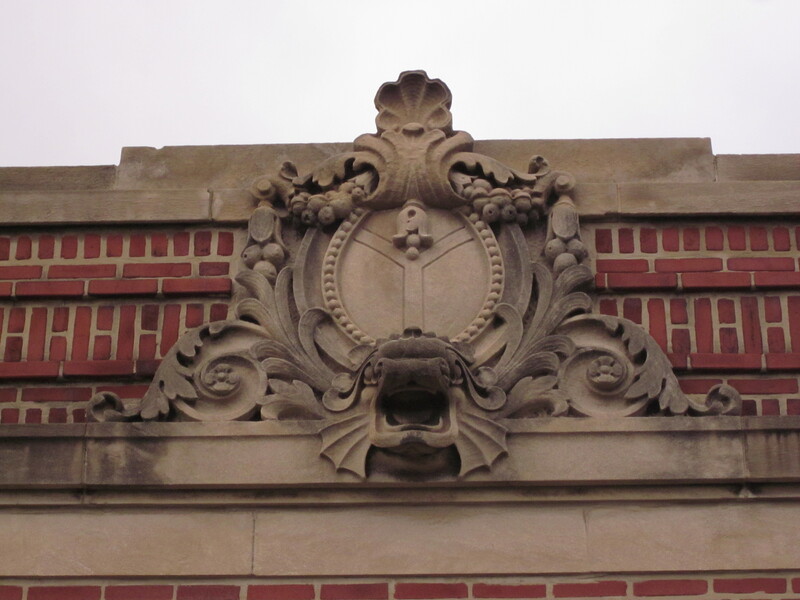 The ornamental shields, medallions, and, in the case of the pumping station, the stylized beastie (possibly a lion, possibly a dragon, perhaps a sea serpent) over the front door, bespeak a common source for ornamentation. But that’s just a personal observation. 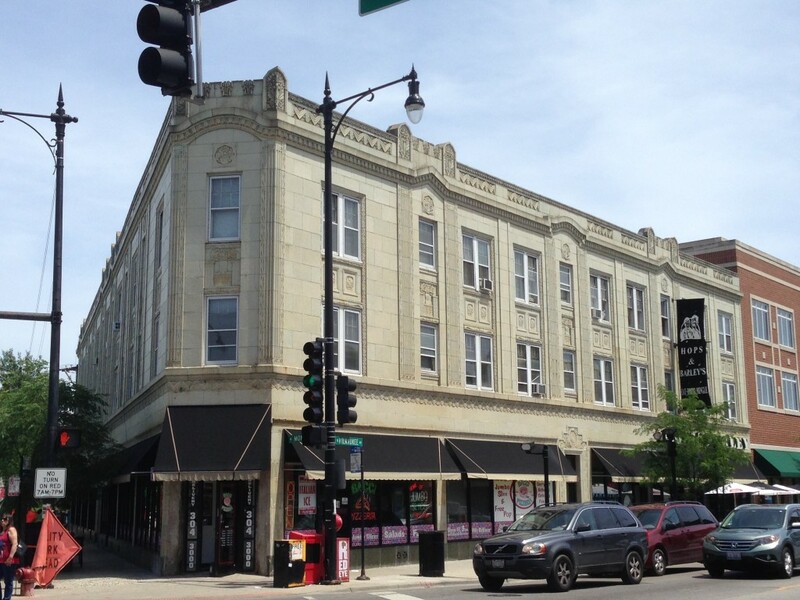 Kallal was also integral to the creation of a sizable, snazzy bath house at 4501 N. Clarendon Avenue in 1916, at the immensely popular Clarendon Avenue Beach (see these sites for views of the building and Turn of the Century Chicagoans frolicking in the surf and sandy turf). Later expansion of Lincoln Park’s beachfront cut into Clarendon’s, and the area became the traditional park it is today. Regrettably, the bath house was deprived of its towers and tile roof during a 1972 renovation, and converted into a community center, giving no indication of its former glory. Much further south, all the way down in Washington Heights, we find a kid brother to the Mayfair Pumping Station in the Department of Gas & Electricity Southwest Substation (10227 S. Halsted). The familiarly checked brick building shows that even though you’re municipal and utilitarian, that doesn’t mean you can’t be cute. I haven’t trekked down to the substation yet, but Flickr photographer/bicyclist Eliezer Appleton graciously gave permission to link to his snapshots of the place. 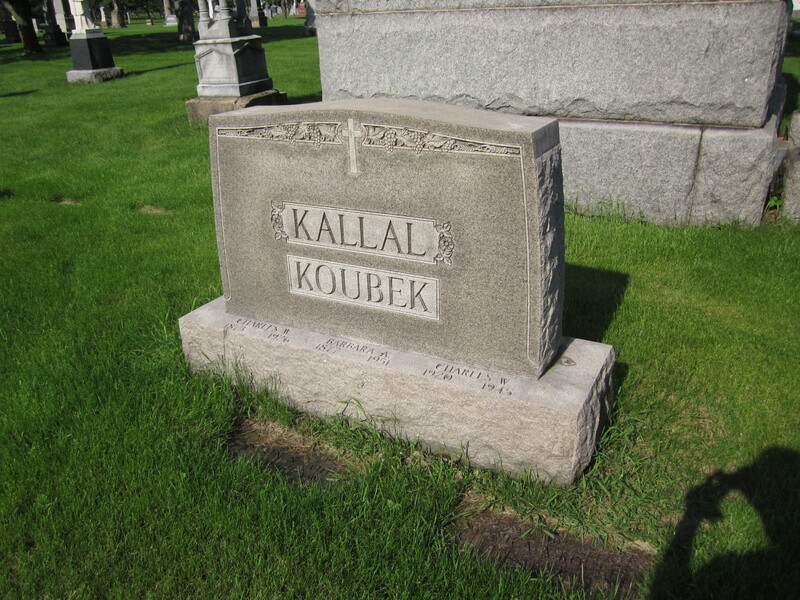 A quiet man, archivally speaking, Kallal left behind few words (though Dominican University in River Forest, IL, holds several letters from Kallal dating from the time he acted as Rosary College’s architectural advisor—he was, apparently, a devout Catholic. Evidence suggests he only published one article on architecture, “The Standard Handball Court,” which appeared in Architecture and Architect Magazine and discusses the construction of such courts for fire stations (Googlebooks provides limited access to this journal; I’d be much appreciative if anyone out there with a copy could send me a scan). In the Tribune, I turned up a single quote in the Dec 31,1918 article “Ask City $35,000 Rental for Old Herald Building.” Addressing the council finance committee by letter regarding the purchase and use of the old, OLD Daily Herald building as a police station, Kallal left behind the immortal words, “the minimum requirements for operation [of the Herald Building were] $35,362, exclusive of heat.” He co-wrote the letter though, so we can’t even be sure those were his words. Sadly, Kallal never made it out of middle age. He died March 7, 1926, at the age of 52 from an ear infection, and currently rests in St. Adalbert’s Cemetery in Niles, IL. Interestingly, his family’s plot rests beside the crypt of George “Papa Bear” Halas, long-time coach and owner of the Chicago Bears. While he may not have been an aesthete and philosopher like Louis Sullivan or Frank Lloyd Wright, or a sculptor of cities like Daniel Burnham, Charles W. Kallal did design useful buildings not unpossessed of charm. They may not be symphonies in stone, but they’re certainly catchy little ditties in brick and glass. Later note: At the suggestion of Mr. Appleton, I checked the Chicago Landmarks site for other buildings connected with Mr. Kallal. 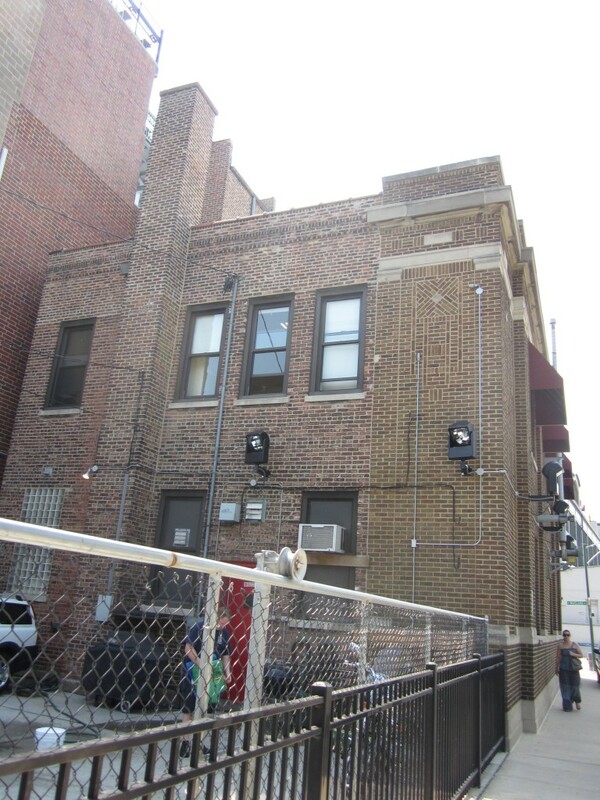 Two more fire stations are located at 2179 N. Stave St. and 330 W. 104th St., while the Lincoln Public Bath House hides at 1019 N. Wolcott Ave. I might take a Father’s Day journey around town to collect photos of every Kallal I can find. Little-known, but hardly nondescript, the northwest neighborhood of Mayfair is an architecturally simple place. 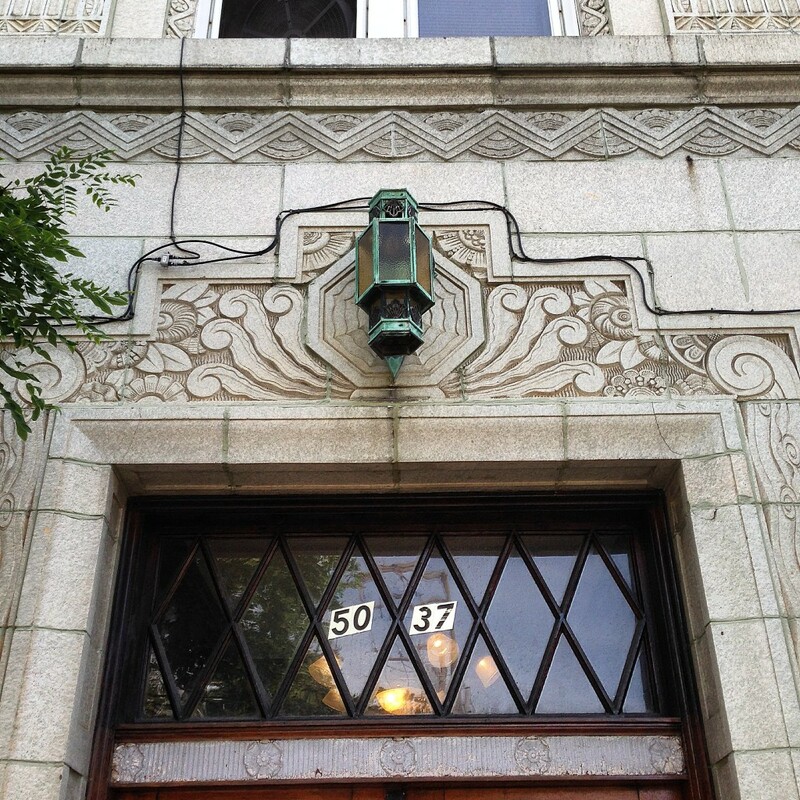 While it has much to recommend for it as the buckle—or, more accurately, a large stud—on Chicago’s Bungalow Belt, the local buildings are mostly pleasant emissaries of their respective eras. Not historically important or particularly stunning, but pretty or impressive in their own way. Such is the case with the Mayfair Pumping Station (4850 W. Wilson Avenue). What might have been a bland stack of utilitarian bricks and glass was instead transformed into a pleasant, visually stimulating interplay of quadrangles. I don’t know what you call this style of architecture, but it manages to seem both old world and bold young Chicago at the same time. A building with the simple function of pumping water to its surrounding community, its history and the man who presumably designed it, are somewhat more interesting and complex. 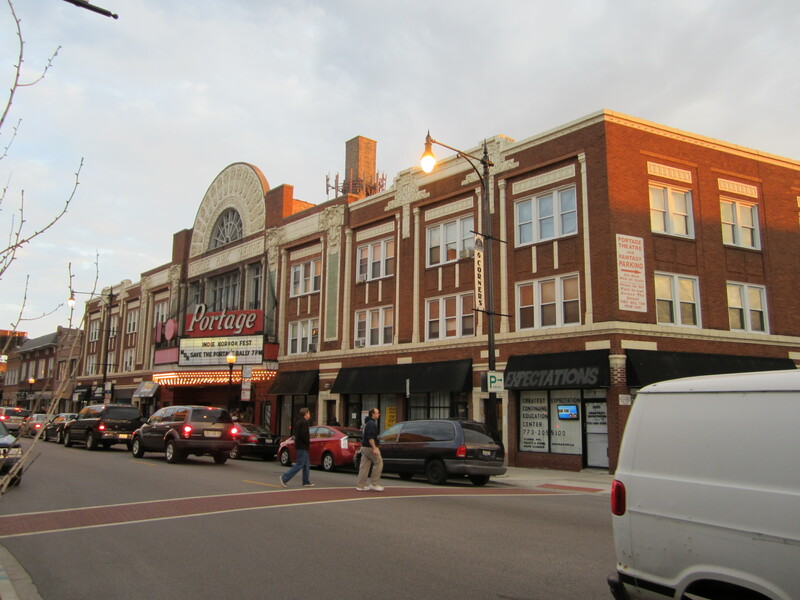 The northwest side was powerful thirsty, but Mayfair and the surrounding villages were a good stretch away from Lake Michigan’s shores. The Lakeview pumping station three miles south kept the water flowing, but water pressure was pathetic—likely a worse situation in those pre-deodorant days. A letter from Mrs. Q.D. Peake to the September 3, 1913 Chicago Daily Tribune’s “The Friend of the People” column bespoke a parched population. 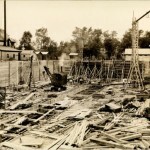 City Engineer John Ericson assured Mrs. Peake that three new engines had been recently installed at the Lakeview station, bringing some oomph to the pressure. More importantly, Mayfair would get its own station in the next few years. 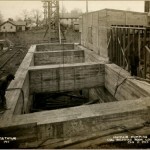 Patience was necessary though, since they’d only just started digging an eight-mile-long connecting tunnel to the Wilson Avenue intake crib, located three miles offshore in Lake Michigan. 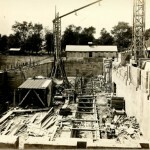 The actual pumping station wouldn’t be completed for a few more years. 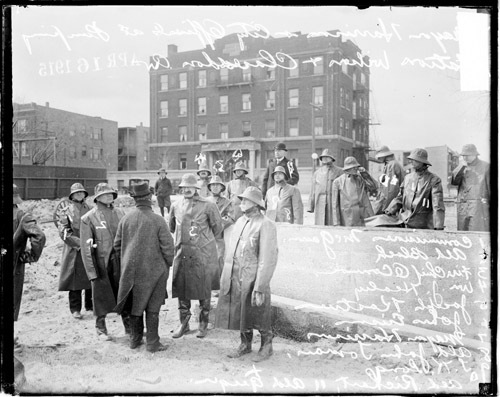 Built on the former farmland of Elsie Budlong, Chicago pickle factory owner, the station’s construction was an imposing task. 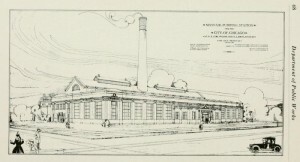 Per the January/June 1915 issue of the professional journal The Iron Age, Chicago City Architect Charles Kallal submitted plans for the station’s engine and boiler room. 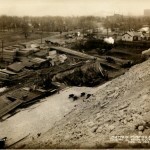 Shortly thereafter—according to the December 31, 1915 Annual Report from the Department of Public Works—56,000 yards of earth needed to be removed from the site by good old-fashioned steam shovels. 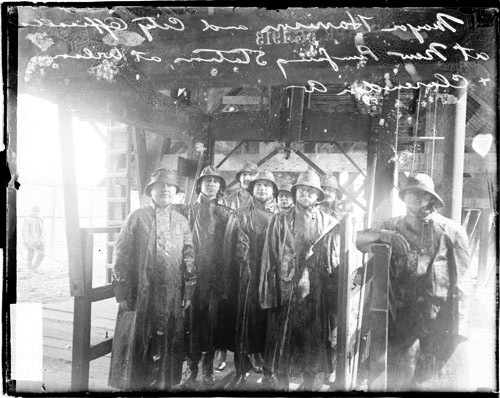 (Note the below photos, taken from John Thomas Lucas’ civil engineering thesis, “Construction of Substructure of Mayfair Pumping Station, City of Chicago (1917)”. On November 22, 1915, the Trib reported the suspension of three city inspectors over delivery of inferior short leaf, “lob lolly” pine to be used in the station’s construction. More than 700,000 feet of lumber had already been delivered. In a June 1916 article topped with the headline “Waste on Northwest Side Threatens Water Famine” (why “famine” rather than “drought,” I’m not sure), Commissioner of Public Works W.R. Moorhouse admonished Mayfairians to stop leaving their faucets and lawn sprinklers running. They were sapping the folks in westerly Austin,IL, and the rest of the northwest side of water pressure. Two years later, on February 21, 1918, “The Friend of the People” ran a letter from “J.L.”, asking when pressure would improve. John Ericson spoke up again, telling J.L. to, as it were, hold his or her water. 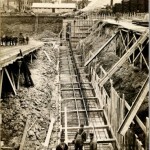 Strikes and a minor thing called World War I had slowed down construction. In a staggering example of how different the times were from our own, the Journal of the American Medical Association (Vol. 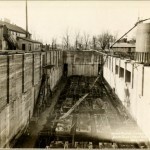 17, 1918) reported that the opening of the Wilson Avenue tunnel and pumping station were once more delayed when it was discovered a worker had typhoid. This may be what delayed opening day July 1, 1918, as reported by the Trib. I suspect they were assiduously avoiding any mention of the deadly disease. Come August 7, the station finally opened its pipes and fired up its engines (a group of horses standing at the ready to keep the pumps moving if the engines failed). But it was an inglorious debut. Flushing out the Wilson tunnel and Mayfair pumps brought only muddy, nonpotable water to the folks in Mayfair, North Austin, Irving Park, Jefferson Park, and West Ravenswood. At last (and according to the cool, clear, somewhat pure Lake Michigan water issuing from my home’s faucets), the station was completed by 1919. Thus far, I lack any period photographs to be sure, but it appears relatively intact. Surely, there are elements of modernization, but, as a friend pointed out, the large front windows and nifty globe lamps out front appear unmolested. 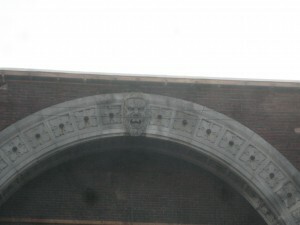 The fact that the building is protected by the government, with attendant signage outside declaring same, have probably kept it unmarred by taggers and salvagers despite its relatively out-of-sight location (it sits beside the Union Pacific/Northwest rail line, and is best reached by driving through the Wilson Avenue tunnel at Cicero). The smokestack, if I’m reading right, is not original, nor in use, since, I’m guessing, the machinery is no longer coal-powered. The previous stack was dismantled in 1958, essentially turned inside out as the workers started at the top, dislodging and heaving bricks into the stack for collection below. It’s unclear when the current smokestack was erected, or if the old one was restored. Next, Chicago City Architect Charles W. Kallal, Floods, Attempted Murder… and Fish!